IL-12 is thought to be involved in the susceptibility to experimental autoimmune encephalomyelitis (EAE), a Th1 cell-mediated autoimmune disorder of the CNS. IL-12 signals through a heterodimeric receptor (IL-12Rβ1/IL-12Rβ2), whose β2-chain is up-regulated on activated, autoreactive Th1 cells. Contrary to the expectation that the absence of IL-12Rβ2 would protect from EAE, we found that IL-12Rβ2-deficient mice developed earlier and more severe disease, with extensive demyelination and CNS inflammation. The inflammatory cells were mainly comprised of CD4+ T cells, monocyte/macrophages, and dendritic cells. Compared to wild-type mice, IL-12Rβ2-deficient mice exhibited significantly increased autoantigen-induced proliferative response and increased production of TNF-α, GM-CSF, IL-17, IL-18/IL-18Rα, and NO. In addition, we found significantly increased levels of IL-23p19 mRNA expression in spleen cells from immunized IL-12Rβ2−/− mice compared with wild-type mice. These findings indicate that IL-12 responsiveness is not required in the pathogenesis of inflammatory demyelination in the CNS, and that, in the absence of IL-12Rβ2, increased IL-23 and other inflammatory molecules may be responsible for increased severity of EAE. EAE is a Th1 cell-mediated autoimmune disease of the CNS, which is used as a model of the human inflammatory demyelinating disease multiple sclerosis. IL-12 is suggested to be crucial for the development of EAE (8, 9, 10, 11). However, little is known thus far about the role of IL-12R in the pathogenesis of EAE. Although in vitro studies indicate that the expression of IL-12Rβ2 correlates with the differentiation of Th1-type myelin-reactive cells (12, 13), the role of IL-12Rβ2 in the induction of EAE has not been investigated. Interestingly, INF-β, an effective treatment in multiple sclerosis, up-regulates the expression of IL-12Rβ2 (14), suggesting that IL-12Rβ2 may have immunoregulatory function. To directly address the role of IL-12Rβ2 in EAE, we studied EAE in IL-12Rβ2-deficient (IL-12Rβ2−/−) mice. We report the novel finding of early and often lethal EAE in IL-12Rβ2−/− mice, with extensive inflammation and demyelination in the CNS. We investigated and discuss the potential mechanisms for this observation. Eight- to 10-wk-old (B6 × 129) mice homozygous for IL-12Rβ2 mutation and their wild-type controls were purchased from The Jackson Laboratory (Bar Harbor, ME). The IL-12Rβ2 gene mutation was created as described and screened by RT-PCR and Southern blot analysis (4, 5). Furthermore, we confirmed the genotypes in our laboratory by using sequence-specific primers according to the protocol recommended by The Jackson Laboratory. To induce EAE, mice were each injected s.c. with 300 μg of myelin oligodendrocyte protein (MOG)35–55 in CFA containing 4 mg/ml Mycobacterium tuberculosis H37Ra (Difco, Detroit, MI) over two sites at the back. Seventy-five nanograms of pertussis toxin was given i.v. on days 0 and 2 postimmunization (p.i.). EAE was scored according to a 0–5 scale as follows (15): 1, limp tail or waddling gait with tail tonicity; 2, waddling gait with limp tail (ataxia); 2.5, ataxia with partial limb paralysis; 3, full paralysis of one limb; 3.5, full paralysis of one limb with partial paralysis of second limb; 4, full paralysis of two limbs; 4.5, moribund; and 5, death. On day 21 p.i., mice were extensively perfused, and spinal cords were harvested. Five-micrometer sections were stained with H&E or Luxol fast blue (myelin stain). Slides were assessed in a blinded fashion for inflammation and demyelination (16). For inflammation, the following scale was used: 0, none; 1, a few inflammatory cells; 2, organization of perivascular infiltrates; and 3, increasing severity of perivascular cuffing with extension into the adjacent tissue. For demyelination, the following scale was used: 0, none; 1, rare foci; 2, a few areas of demyelination; and 3, large (confluent) areas of demyelination. MNCs from the spinal cords were isolated as previously described (17). Pooled cells (1 × 106) were washed in FACS buffer. After blocking with CD16/CD32 Abs, cells were incubated with Abs to murine CD4, CD11b, CD11c, and CD45 (all from BD PharMingen, San Jose, CA). Data were acquired on a FACSCalibur (BD Biosciences, Mountain View, CA). MNCs were gated, and fluorescence was analyzed using CellQuest (BD Biosciences) software. Data represent 10,000 events. Suspensions of MNCs from the spleen were prepared on day 21. 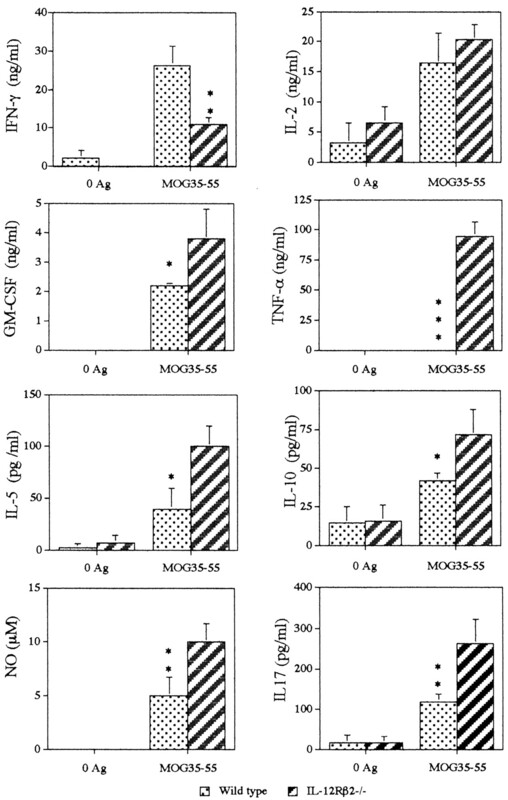 Cells were cultured at a density of 2.5 × 106/ml in medium containing MOG35–55 at the final concentrations of 1, 10, and 25 μg/ml, Con A at 5 μg/ml, or without Ag/mitogen. Supernatants were collected after 48 h. Quantitative ELISAs for IFN-γ, IL-2, TNF-α, IL-4, IL-5, IL-10, and IL-17 were performed using paired mAbs according to the manufacturer’s recommendation (BD PharMingen). For proliferation, cells were cultured in triplicate with various doses of MOG35–55, 5 μg/ml Con A, or without Ag/mitogen. After 60 h of incubation, the cells were pulsed for 12 h with 1 μCi of [3H]methylthymidine. Cells were harvested and counts read using a beta-counter. The results were expressed as stimulation index, which was calculated by dividing the cpm from culture in the presence of Ag or mitogen by the cpm from culture without Ag/mitogen. Sera were collected at day 21, when mice were sacrificed. MOG35–55 peptide (0.1 ml/well, 3 μg/ml) or PLP139–151 peptide (0.1 ml/well, 3 μg/ml) were added to 96-well microtiter plates and incubated at 4°C overnight. After three washes, the plates were blocked with 10% FCS in PBS for 2 h at room temperature. Diluted sera (0.1 ml/well, 1/50) were added to the wells and incubated at room temperature for 2 h. HRP-conjugated anti-mouse IgG (1/2000; Sigma-Aldrich, St. Louis, MO), IgG1 and IgG2a (1/500; BD PharMingen) Abs were then added and incubated at room temperature for 2 h. The reaction was developed with tetramemethylbenzidine microwell peroxidase substrate and read at 450 nm in an ELISA reader. For determination of apoptosis by TUNEL, spleen cells (2 × 106/ml) were isolated 10 days p.i. and cultured for 96 h in medium containing 10% FCS, then washed in PBS, fixed, permeabilized, and incubated for 60 min at 37°C with TdT and FITC-labeled dUPT (all from Roche, Indianapolis, IN). After washing, FITC-dUTP-labeled DNA strand breaks were detected by flow cytometry. Negative control samples contained no TdT, whereas positive control samples were incubated with DNAse I (Roche) for 10 min at room temperature prior to incubation with TdT and labeled nucleotides. 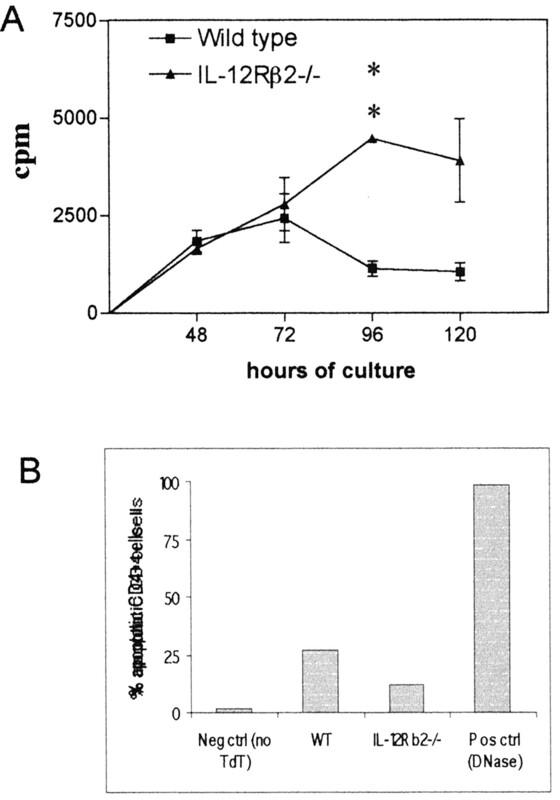 Proliferation was measured by incorporation of [3H]thymidine in parallel at 48, 72, 96 and 120 h after culture. Analysis of IL-18Rα expression was performed as previously described (18). Briefly, isolated splenocytes from immunized mice (10 days p.i.) were first cultured with MOG35–55 (10 μg/ml) for 48 hrs. After extensive washing, cells were incubated for 10 min with 1 μg of rat anti-mouse CD16/32 (Fc block; BD PharMingen) to block nonspecific binding of goat Ig/anti-IL-18Rα to FcR. Cells were then washed and incubated for 30 min with either 1 μg of biotinylated goat IgG or 1 μg of biotinylated goat anti-mouse IL-18Rα (R&D Systems, Minneapolis, MN) diluted in PBS-BSA, and then resuspended in streptavidin-PerCP and anti-mouse CD4-APC. Data were acquired and analyzed as above. The concentration of IL-18 in the supernatants after 48 h culture was determined using an IL-18 OptEIA kit according to the manufacturer’s recommendation (BD PharMingen). Quantification was performed as described (19) with modifications. Splenocytes were isolated at days 21 p.i. Total RNA was extracted from homogenized mouse brains or splenocytes (1 × 107) using TRIzol reagent (Invitrogen, San Diego, CA) according to the manufacturer’s instructions. The purity and integrity of RNA were determined by absorbance at A260/280 and gel electrophoresis. Contamination by genomic DNA was excluded by real-time PCR amplification of RNA by β-actin primers. The levels of β-actin, IL-12p40, IL-12p35, and IL-23p19 mRNA were quantified by real-time PCR on a LightCycler (Roche). One-step RT-PCR was performed in 20 μl of hot-start reagent mix (LightCycler-RNA Master SYBR green I) containing 1 μl (250 ng) RNA template, and monitored in real time with the fluorescent DNA binding dye SYBR green (Roche). The following primer pairs were used: β-actin, forward, 5′-TGT GAT GGT GGG AAT GGG TCA G-3′, and reverse, 5′-TTT GAT GTC ACG CAC GAT TTC C-3′; IL-12p40, forward, 5′-GAC CCT GCC CAT TGA ACT GGC-3′, and reverse, 5′-CAA CGT TGC ATC CTA GGA TCG-3′; IL-12p35, forward, 5′-GAG GAC TTG AAG ATG TAC CAG-3′, and reverse, 5′-TTC TAT CTG TGT GAG GAG GGC-3′; and IL-23p19, forward, 5′-TGC TGG ATT GCA GAG CAG TAA-3′, and reverse 5′-GCA TGC AGA GAT TCC GAG AGA-3′ (20). Standard curves for these molecules were generated by performing 10-fold dilutions of known amounts of cytokine RNA (LightCycler control kit RNA; Roche). The concentrations of the samples were automatically calculated by computer software based on the standard curves obtained from known concentrations. The mRNA level was normalized based on the levels of the β-actin value for each sample (Applied Biosystems, Foster City, CA). ANOVA was used for the comparison of clinical score, proliferative responses, and cytokine profiles between different groups. Kolmogorov-Smirnov statistics were used for the comparison of flow cytometry data. All significance tests were two-sided. To investigate the role of IL-12Rβ2 in the pathogenesis of EAE, we immunized IL-12Rβ2-deficient mice on the H-2b background and their wild-type controls with MOG35–55 peptide in CFA. Chronic progressive EAE was observed in immunized wild-type mice. No mice from this group (n = 15) died or were moribund during the time of observation. In contrast, IL-12Rβ2−/− mice developed earlier and more severe EAE (Table I⇓; Fig. 1⇓). Two of 13 animals died, and 10 of 13 were moribund by day 21, so that mice in all three experiments had to be sacrificed at this time point. The differences in both time of EAE onset and clinical scores between the two groups were significant (both p < 0.001). IL-12Rβ2−/− mice develop severe EAE. Female wild-type and IL-12Rβ2−/− mice (n = 5 in each group) were immunized with 300 μg of MOG35–55 peptide in CFA. Clinical EAE was scored daily according to a 0–5 severity scale. Data represent the mean clinical score ± SD. The overall clinical score was significantly different between wild-type and IL-12Rβ2−/− mice (p < 0.001). One representative experiment of three is shown (total n = 15 wild-type and 13 IL-12Rβ2−/− mice). Consistent with clinical signs, typical MNC infiltration and demyelination foci were observed in the white matter of the spinal cord of wild-type mice. Both inflammation and demyelination scores in these mice were 1.9 ± 0.6 (Fig. 2⇓, A–C and G). In contrast, the scores for infiltration and demyelination reached the highest (3.0 ± 0) in all IL-12Rβ2−/− mice (Fig. 2⇓, D–G; both p < 0.001 compared to wild-type mice). The average number of MNCs per spinal cord in wild-type mice was 14 × 105. Flow cytometric analysis of these cells showed the presence of CD4+ T cells, CD8+ T cells, and CD11b+CD45+ macrophages/microglia in immunized wild-type mice (Fig. 3⇓). Thirty-one percent of the latter cells expressed a high level of CD45 (CD45high) (R2 in Fig. 3⇓A), as typically observed in activated infiltrating macrophages (21, 22, 23). CD11b+CD45int cells (activated resident microglia) (21, 24) were also present in wild-type mice. A significant fraction of CD11b+CD45+ cells had a dendritic cell (DC) phenotype (CD11c+) (22, 23, 25). As shown in Fig. 3⇓B, inflammatory infiltration was more severe in IL-12Rβ2−/− mice, as demonstrated by the significantly increased number of total CNS-derived MNCs (30 × 105/spinal cord vs 14 × 105 in wild-type mice) and various subsets, including CD4, CD8, macrophages (CD11b+CD45high, 39.2% among all CD11b+CD45+ cells; R2 in Fig. 3⇓A) and DCs (Fig. 3⇓B). The number of CNS DCs (CD11b+CD11c+) was increased 3-fold in IL-12Rβ2−/− compared to wild-type (9.3 × 105 vs 3.6 × 105 cells/spinal cord) (Fig. 3⇓B). Thus, a clear correlation was found between clinical and pathological features of EAE in wild-type and IL-12Rβ2−/− mice. Spinal cord histology. 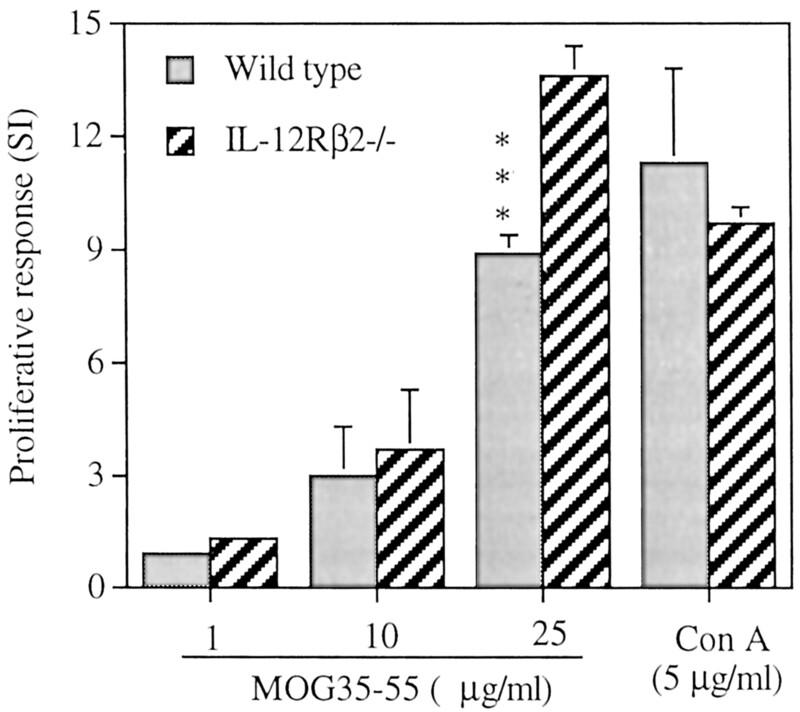 Wild-type mice and IL-12Rβ2−/− mice were immunized with MOG35–55 in CFA and sacrificed at day 21 p.i. Spinal cords were harvested after extensive perfusion, and 5-μm sections were stained with H&E or Luxol fast blue (myelin stain). Wild-type mice exhibited typical EAE cellular infiltration (A) and demyelination (B and C). 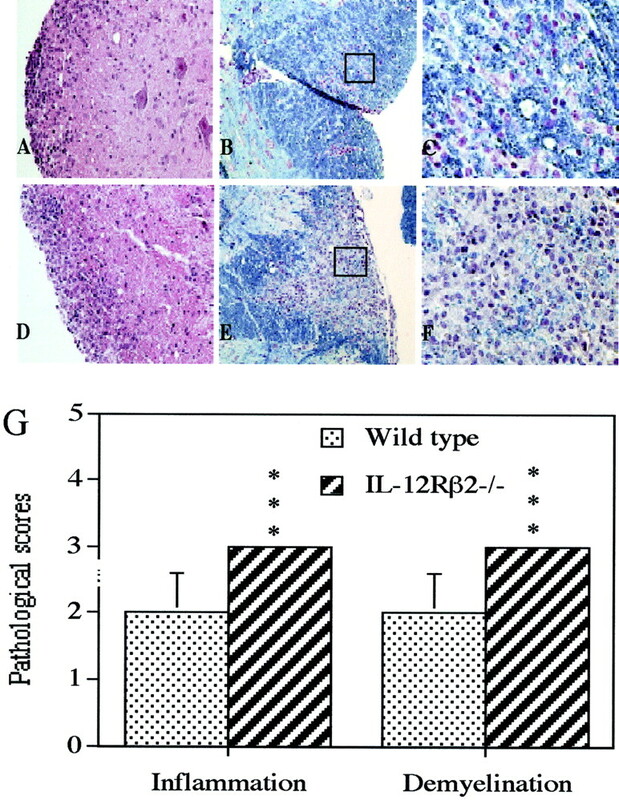 IL-12Rβ2−/− mice exhibited severe cellular infiltration (D) and demyelination (E and F). G, Mean scores of inflammation and demyelination ± SD in wild-type mice (n = 4) and IL-12Rβ2−/− mice (n = 5). ∗∗∗, p < 0.001. One representative experiment of three is shown. Pattern of cellular infiltrates in spinal cords of wild-type and IL-12Rβ2−/− mice. A, Flow cytometric analysis. On day 21 p.i., mice were extensively perfused, and spinal cords were harvested and pooled for each mouse group (n = 4 in wild-type mice and n = 5 in IL-12Rβ2−/− mice). The percentage of CD4+ T cells, CD8+ T cells, CD11c+ cells (DCs), and infiltrating macrophages (CD11b+CD45high; R2) are shown. The differences for all these cell subsets are statistically significant (p < 0.01). The average number of total CNS-derived MNCs and various subsets per spinal cord in wild-type and IL-12Rβ2−/− mice are summarized in B. We analyzed MOG35–55-specific T cell responses in wild-type and IL-12Rβ2−/− mice. At day 21 p.i. (peak of disease), a specific Th1 response to MOG was observed in spleen-derived lymphocytes from wild-type mice. This response was characterized by vigorous MOG-induced proliferation (Fig. 4⇓) and production of high levels of IL-2 (16.4 ± 5.1 ng/ml), GM-CSF (2.2 ± 0.1 ng/ml), IL-17 (118.1 ± 18.8 pg/ml), and IFN-γ (26.2 ± 5.2 ng/ml) (Fig. 5⇓). In IL-12Rβ2−/− mice, which developed severe EAE, a more severe proinflammatory response was observed compared to that of wild-type mice, including an increased proliferation of specific T cells to MOG (Fig. 4⇓), high levels of IL-2 (20.4 ± 2.4 ng/ml), GM-CSF (3.8 ± 1.0 ng/ml; p < 0.05), TNF-α (95.0 ± 12.0 pg/ml; p < 0.001), and IL-17 (263.0 ± 60 pg/ml; p < 0.025) (Fig. 5⇓). However, production of IFN-γ was reduced (10.8 ± 1.9 ng/ml; p < 0.025), as previously reported in IL-12Rβ2−/− mice (5). Nitrite production was also increased in IL-12Rβ2−/− mice (10.1 ± 1.8 μM) compared to that of wild-type mice (5.0 ± 1.7 μM; p < 0.001; Fig. 5⇓). Cytokine production was not determined at later time points as most IL-12Rβ2−/− mice either died or were humanely sacrificed by day 21. Interestingly, we also found that, in spite of increased disease severity, IL-12Rβ2−/− mice produced a higher level of MOG-induced IL-5 and IL-10 compared to wild-type mice (Fig. 5⇓), although IL-4 was not detectable in both groups (data not shown). We consider this phenomenon most likely due to increased but ineffective anti-inflammatory response in the presence of intense CNS inflammation (26). Elevated MOG35–55-induced proliferative response in IL-12Rβ2−/− mice. Pooled splenocytes (4 × 105/well) from wild-type (n = 4) and IL-12Rβ2−/− mice (n = 5; day 21 p.i.) were cultured with MOG35–55 at 1, 10, and 25 μg/ml, Con A at 5 μg/ml, or without Ag/mitogen. Data represent mean values and SD of three separate experiments. Values of p refer to comparison between wild-type and IL-12Rβ2−/− mice. ∗∗, p < 0.01; ∗∗∗, p < 0.001. Production of cytokines and NO in response to MOG35–55. Pooled splenocytes (4 × 105/well) from wild-type (n = 4) and IL-12Rβ2−/− mice (n = 5; day 21 p.i.) were cultured with MOG35–55, Con A, or without Ag/mitogen. Production of cytokines and NO were determined from 48-h culture supernatants as described in Materials and Methods. Data represent mean values and SD of three separate experiments. Values of p refer to comparison between two groups. ∗∗, p < 0.025; ∗∗∗, p < 0.001. We then measured the levels of total IgG, IgG1 (Th2-driven), and IgG2a (Th1-driven) Abs in response to MOG and the control myelin Ag PLP. No significant difference was observed between the two mouse strains (Table II⇓). To further explain more severe inflammation in IL-12Rβ2−/− mice, we tested the hypothesis that decreased T cell apoptosis may contribute to the elevated inflammatory responses. We found that spontaneous proliferation of spleen-derived MNCs was higher in IL-12Rβ2−/− mice (Fig. 6⇓A; p < 0.005). In addition, we used a TUNEL technique to study apoptosis of spleen CD4+ T cells cultured for 96 h in medium containing 10% FCS and found a 50% decrease in apoptosis of CD4+ T cells in IL-12Rβ2−/− mice (Fig. 6⇓B; p < 0.001). Thus, reduced apoptosis of CD4+ cells may have contributed to disease severity in IL-12Rβ2−/− mice. Reduced apoptosis in CD4+ T cells of IL-12Rβ2−/− mice. Mice were immunized with MOG35–55 in CFA. Ten days p.i., splenocytes of IL-12Rβ2−/− and wild-type mice (n = 5 in each group) were isolated and cultured for 96–120 h. Proliferation (A) was measured by incorporation of [3H]thymidine at the indicated time points. ∗∗, p < 0.005. Apoptosis (B) was measured at 96 h after culture by TUNEL as described in Materials and Methods. One representative experiment of two is shown. The difference is statistically significant (p < 0.001). To study whether the IL-18/IL-18R system plays a role in the enhancement of EAE in IL-12Rβ2−/− mice, we determined IL-18 production by splenocytes and IL-18Rα expression on CD4+ T cells. 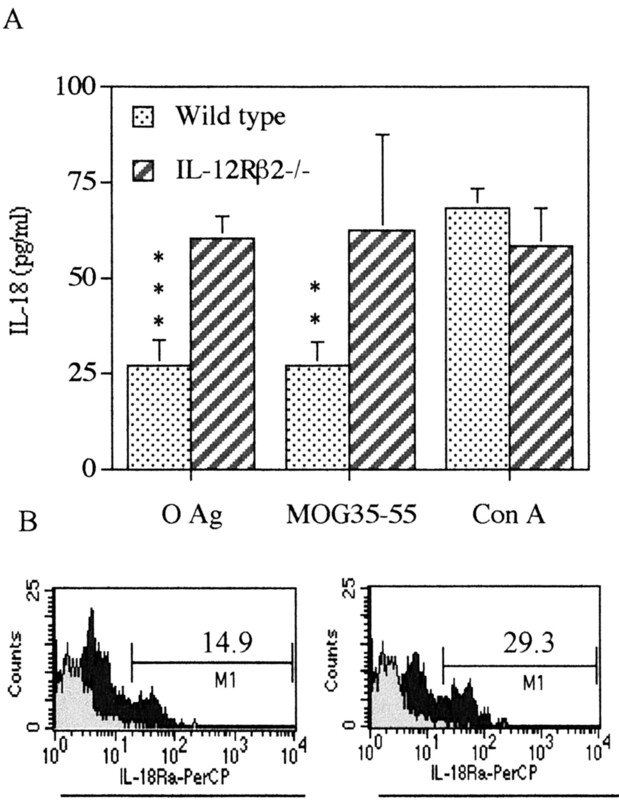 Significantly increased production of IL-18 was found in IL-12Rβ2−/− mice compared with wild-type mice, with and without stimulation by autoantigen MOG35–55 (Fig. 7⇓A; p < 0.001 and p < 0.01, respectively). A 2-fold increase in the expression of IL-18Rα on CD4+ T cells from IL-12Rβ2−/− mice (29.3% positive cells) was observed compared with that of wild-type mice (14.9% positive cells) (Fig. 7⇓B; p < 0.001). These results suggest a potential contribution of increased production of IL-18 and responsiveness of CD4+ T cells to IL-18 to increased EAE severity in IL-12Rβ2−/− mice. Production of IL-18 and IL-18Rα expression. A, Splenocytes (4 × 105/well) from wild-type and IL-12Rβ2−/− mice (n = 4 in each group; day 10 p.i.) were cultured for 48 h with MOG35–55, Con A, or without Ag/mitogen. Production of IL-18 in supernatants was determined by ELISA as described in Materials and Methods. Data represent mean values and SD of three separate experiments. Values of p refer to comparison between two groups. ∗∗, p < 0.01; ∗∗∗, p < 0.001. B, IL-18Rα expression on CD4+ T cells of spleen from wild-type and IL-12Rβ2−/− mice (n = 5 in each group) was determined by flow cytometry. A biotinylated anti-rat IgG1 Ab was used as isotype control. One representative experiment of two is shown. The difference is statistically significant (p < 0.001). To test the hypothesis that an increased production of IL-23 (p40p19) may contribute to enhanced disease severity in IL-12Rβ2−/− mice, we measured the level of mRNA expression for IL-23p19, IL-12p40, and IL-12p35 by real-time PCR in splenocytes of mice immunized with MOG. As shown in Fig. 8⇓, mRNA expression of IL-23p19 in the splenocytes of IL-12Rβ2−/− mice was 5.1 times higher in IL-12Rβ2−/− mice (16.7 ± 6.0 fg/μg total RNA) than in wild-type mice (3.3 ± 0.2 fg/μg total RNA). IL-12p40 and IL-12p35 mRNA expression did not differ significantly in wild-type and IL-12Rβ2−/− mice. We then measured the level of IL-23p19, IL-12p40, and IL-12p35 mRNA expression in the brains of wild-type and IL-12Rβ2−/− mice. There was a 3-fold increase in the average expression of IL-23p19 mRNA in the brain of IL-12Rβ2−/− mice, which did not reach statistical significance (Fig. 8⇓). There was also a tendency toward increased expression of IL-12p40 and IL-12p35 in the brain of IL-12Rβ2−/− mice. Increased expression of IL-23p19 suggests that IL-23 compensates for the lack of IL-12 responsiveness in IL-12Rβ2−/− mice with EAE and perhaps is responsible for the severe inflammation in the CNS. Quantitative detection of IL-12p40, p35, and IL-23p19 mRNA transcripts in splenocytes and brain tissues by real-time PCR. Total RNA was isolated from spleen cells and brain tissue of MOG-immunized wild-type mice (n = 4) and IL-12Rβ2−/− mice (n = 5) on day 21 p.i. Specific transcripts of IL-12p40, p35, and IL-23p19 were amplified by real-time PCR. Primers for β-actin (housekeeping gene) were used in parallel. The concentrations of the samples were automatically calculated by computer software based on the standard curves. mRNA level was normalized based on the levels of the β-actin value for each sample. Results are expressed as femtograms of mRNA/micrograms of total RNA. Columns and bars represent the average levels and SD of IL-12p40, p35, and IL-23p19 mRNA expressed by splenocytes and brain tissues. ∗∗∗, p < 0.001. Experiments were repeated twice and similar results were obtained. In this study, we report that IL-12Rβ2−/− mice develop severe MOG-induced EAE, which is characterized by early onset, more severe paralysis, increased mortality, and more extensive demyelination and inflammatory infiltration compared with that of IL-12Rβ2-sufficient mice. Furthermore, IL-12Rβ2−/− mice exhibited elevated proliferative response to autoantigen, increased production of the proinflammatory molecules TNF-α, GM-CSF, IL-17, and NO, increased production of IL-18 and expression of IL-18Rα and mRNA expression of IL-23p19. These observations suggest a more complex role of the IL-12/IL-12R system in the pathogenesis of CNS inflammatory demyelination. Disease severity in wild-type and IL-12Rβ2−/− mice correlated with the degree of CNS inflammation and demyelination. 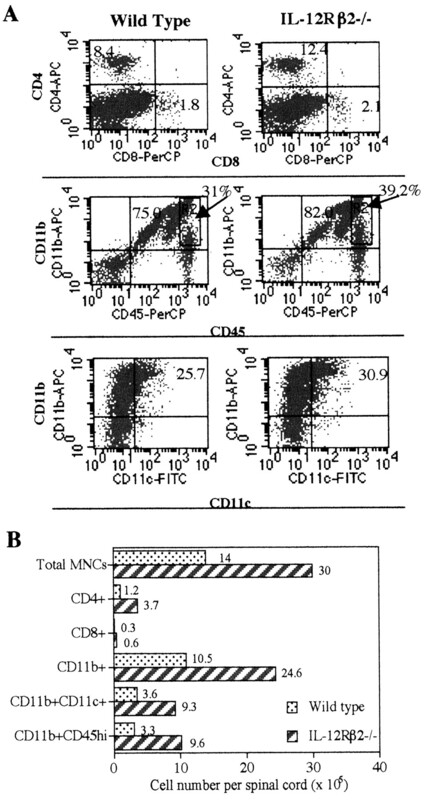 Infiltrating cells were mainly comprised of CD4+ T cells and monocyte/macrophages (Fig. 3⇑). Infiltrating monocytes/macrophages have been reported to function as effectors and amplifiers of CNS inflammation by producing TNF-α, GM-CSF, and NO (23, 24). Of note is that a significant fraction (Fig. 3⇑B) of CD11b+ cells in the CNS had a DC-like phenotype (CD11c+). The total number of spinal cord DCs was increased 3-fold in IL-12Rβ2−/− mice (Fig. 3⇑B). DCs are virtually absent from the normal CNS. During inflammation, DCs can either infiltrate the CNS from the periphery or differentiate from CNS-resident microglia, driven by an increased level of GM-CSF (Fig. 5⇑) (23, 25, 27). DCs are the most potent APCs and can initiate Th1-mediated CNS immunopathology (23, 25). Therefore, a 3-fold increase in the number of DCs in the CNS may be sufficient to induce more severe inflammation in IL-12Rβ2−/− mice. The characterization of peripheral immune-cell cytokine response to MOG demonstrated that IL-12Rβ2−/− mice are capable of generating a Th1-type cytokine response, which includes IL-2, IFN-γ, and TNF-α, even though IFN-γ production is lower than that in wild-type mice (4, 5). 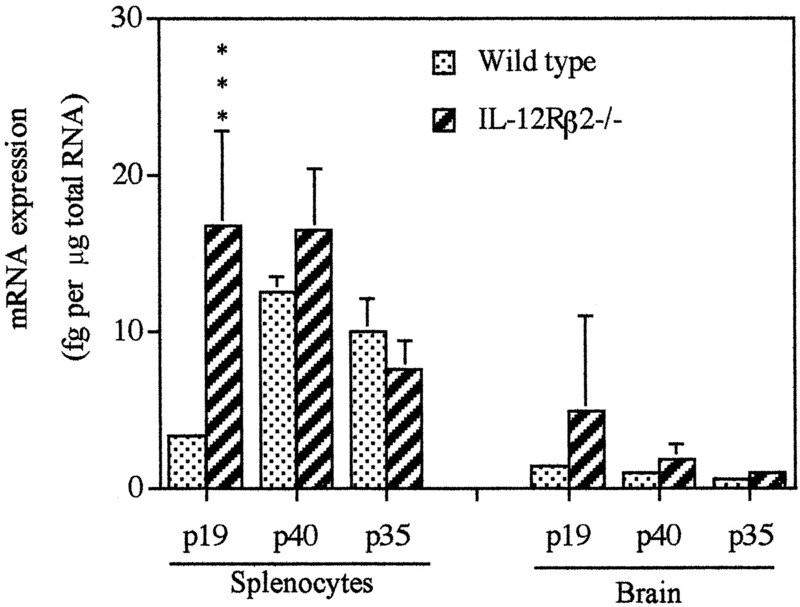 IL-12Rβ2−/− mice also produced higher levels of other proinflammatory cytokines, such as GM-CSF. This cytokine plays an important role in the induction of EAE by promoting the development of inflammatory demyelinating lesions as well as the migration and proliferation of leukocytes within the CNS (Figs. 3⇑ and 5⇑) (23, 25, 27). Furthermore, GM-CSF is very effective in the induction of DC differentiation from their precursors (23, 25). Since Th1 cells have been reported to preferentially express the IL-12Rβ2 chain (12, 13), this observation suggests a more complex role of the IL-12Rβ2 in the development of Th1 cells than was previously thought. It has been found that transgenic expression of IL-12Rβ2 does not restore the Th1 phenotype in committed Th2 cells (28, 29). Even IL-12p40−/− mice have been reported to be defective, although not devoid of type-1 cytokine responses (30). Together, these observations suggest that IL-12 responsiveness is not strictly required for Th1 cell development (2, 31). These data also confirm previous reports that IFN-γ is not essential for MOG-induced EAE expression and suggest a regulatory rather than a proinflammatory function of this cytokine in EAE (32, 33). To further study the mechanism underlying the increased susceptibility of EAE in IL-12Rβ2−/− mice, we have determined the production of IL-17, a T cell-derived proinflammatory molecule (34, 35, 36, 37), which is up-regulated in EAE and MS lesions (38). Consistent with the increased severity of clinical EAE, we found increased production of IL-17 upon stimulation of spleen cells of IL-12Rβ2−/− mice with MOG35–55 (Fig. 5⇑). Our results are supported by a recent in vitro study, in which splenocytes from IL-12Rβ2−/− mice have been shown to produce elevated levels of IL-17 both constitutively and upon stimulation with IL-23 (37). By contrast, IL-12 added to CD4+ T cell cultured with IL-23 inhibited IL-17 production in a dose-dependent manner (37). These data suggest that lack of IL-12 responsiveness in IL-12Rβ2−/− mice may remove physiological down-regulation of IL-17 production by IL-12 and promote unopposed up-regulation of IL-17 by IL-23. Increased production of TNF-α in IL-12Rβ2−/− mice (Fig. 5⇑) suggests an involvement of this cytokine in the induction of autoimmune inflammatory demyelination. In the same EAE model used in this study, TNF-α has been shown to be produced by CNS-infiltrating T cells, as well as by infiltrating macrophages and CNS-resident microglia (24). In our study, the increased level of TNF-α in IL-12Rβ2−/− mice could result from the up-regulation of IL-18/IL-18R and IL-23 (see Figs. 7⇑ and 8⇑). IL-18 is a potent inducer of proinflammatory cytokines, including TNF-α (39). In addition, mice overexpressing p19, a subunit of the recently described cytokine IL-23, produce a significantly higher level of TNF-α than do wild-type mice. Such overproduction may contribute to the spontaneous inflammation and high mortality observed in those mice (20). TNF-α is thought to play a key role in the development of EAE by mechanisms that include oligodendrocyte toxicity, up-regulation of the expression of adhesion molecules, and the induction of chemokine production (24, 40, 41). Signaling through TNFRI has been shown to correlate with severity of symptoms and demyelination in MOG-induced EAE, whereas TNFRII may play a protective role (42). A significantly increased production of the NO metabolite nitrite was also found in IL-12Rβ2−/− mice. Although IFN-γ is the primary inducer of NO production, NO can also be induced by non-IFN-γ-mediated pathways, e.g., by TNF-α (43), GM-CSF (44), IL-1β (44), and IL-18 (45). We did not determine the level of IL-1β in this study. However, increased TNF-α, GM-CSF, and IL-18/IL18R interaction could be involved in the increased NO production in IL-12Rβ2−/− mice (Figs. 5⇑ and 7⇑). In addition to IFN-γ induction, IL-18 could also lead to increased production of GM-CSF, TNF-α, and IL-1β (39, 46), all of which have been shown to be associated with a high level of NO production (see Fig. 5⇑). Both toxic and protective roles have been demonstrated for NO in several EAE models (47). Our results suggest a role for NO in mediating increased severity of EAE in IL-12Rβ2−/− mice. This may occur through direct toxicity to oligodendrocytes, as well as by enhancing the toxicity of TNF-α (47) (Fig. 5⇑). Since anti-MOG Abs aggravate T cell-mediated CNS demyelination in several EAE models (48), we measured total IgG as well as IgG1 (Th2-driven) and IgG2a (Th1-driven) anti-MOG Abs in the serum of immunized mice. We did not find a correlation between disease susceptibility or severity and the levels of anti-MOG Abs. This observation is consistent with previous reports that B cell-deficient C57BL/6 mice are susceptible to MOG-induced EAE (49). It has been shown that apoptosis of Ag-specific T cells is an important factor for EAE severity and recovery (50, 51). Exogenous IL-12 protects mice from experimental autoimmune uveitis, a Th1 cell-mediated autoimmune disease, through a mechanism involving IFN-γ/NO-induced apoptosis (52). We hypothesized that decreased T cell apoptosis may contribute to severe CNS autoimmune demyelination in IL-12Rβ2−/− mice. There was a tendency for spleen of IL-12Rβ2−/− mice to contain a higher number of MNCs (106 ± 26 × 106/spleen) compared to wild-type mice (85 ± 12 × 106). Therefore, IL-12Rβ2−/− spleen may contain a high number of MOG-specific T cells. When we examined the potential role of apoptosis in the disease severity, we found decreased apoptosis of CD4+ T cells and significantly higher proliferation of spleen-derived MNCs in IL-12Rβ2−/− mice. Thus, reduced apoptosis of CD4+ cells may contribute to disease severity in IL-12Rβ2−/− mice. The involvement of apoptosis in the disease severity in IL-12Rβ2−/− mice is currently under investigation. The development of severe EAE and high level of proinflammatory cytokines in IL-12Rβ2−/− mice was intriguing because IL-12 signaling is faulty in these mice. IL-18 is critical in the induction of IFN-γ, GM-CSF, TNF-α, and IL-1 (46) and is involved in the development of EAE (53, 54). It also synergizes with IL-12 and IL-23 in the induction of Th1 responses (7) (55). In the present study, we found that IL-12Rβ2−/− MNCs showed significantly increased production of IL-18. In addition, CD4+ T cells showed increased expression of IL-18Rα. Culture with MOG35–55 did not change the production of IL-18, presumably because IL-18 is produced by APCs, but not by Ag-specific T cells. The increase in IL-18 production and responsiveness to IL-18 may be one of the contributing factors to disease severity in these mice. In addition, increased IL-18 production and IL-18Rα expression in IL-12Rβ2−/− mice suggest a modulatory effect of IL-12Rβ2 on the IL-18/IL-18R pathway system. We hypothesized that the recently described cytokine IL-23 (p40p19) could contribute to increased EAE severity in IL-12Rβ2−/− mice. IL-23 shares the p40 subunit with IL-12 (p40p35) and binds IL-12Rβ1, but not IL-12Rβ2 (6, 56). 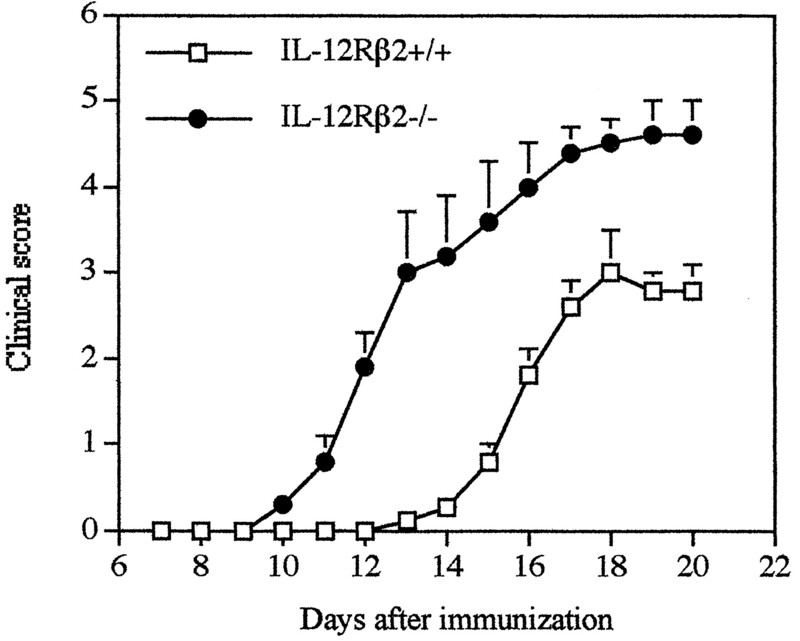 Therefore, the absence of IL-12Rβ2 impairs functional responses to IL-12, but not to IL-23. To address the role of IL-23, we measured the level of p19, p40, and p35 mRNA expression in the spleen of wild-type mice and IL-12Rβ2−/− mice. We found that splenocytes of IL-12Rβ2−/− mice expressed higher mRNA levels of IL-23p19 than did those of wild-type mice, whereas IL-12p40 and IL-12p35 levels did not differ in the two groups (Fig. 8⇑). Because IL-23 shares several functions with IL-12, including the induction of Th1 cells (6, 31), elevated IL-23 may lead to an augmented proinflammatory response as observed in our study. Increased disease severity suggests that IL-12Rβ2 may normally modulate the proinflammatory activity of IL-23. Because the receptors for IL-12 and IL-23 share the IL-12Rβ1 chain, the lack of IL-12Rβ2 may increase the availability of IL-12Rβ1 to form heterodimeric receptors for IL-23 (IL-12Rβ1/IL-23R) (7). The involvement of IL-23 suggested in the present study is supported by the recent observation that IL-12p35−/− mice, which lack IL-12, but are expected to have functional IL-23, are susceptible to MOG-induced EAE (57, 58). The potential for overexpression of p19, the smaller subunit of IL-23, to induce target organ inflammation has been recently documented (20). Confirmation of the role of IL-23 in EAE and the mechanisms of increased IL-23 production in the absence of IL-12Rβ2−/− awaits the availability of p19-deficient mice and neutralizing anti-IL-23 Abs. In summary, we report the unexpected finding of severe EAE in the absence of IL-12Rβ2. The mechanisms for this observation include increased production of proinflammatory molecules (such as TNF-α, GM-CSF, IL-17, and NO), elevated IL-18/IL-18R interaction, and perhaps increased production of IL-23. The demonstration that the absence of IL-12Rβ2 can enhance the severity of EAE should further encourage the study of the IL-12/IL-23 system in experimental and human autoimmunity. We thank Elvira Ventura for technical assistance, Dr. Justin L. Parr for help with preparation and evaluation of pathological samples, and Katherine Regan for editorial assistance. ↵1 This work was supported by grants from the National Institutes of Health and the National Multiple Sclerosis Society. ↵3 Abbreviations used in this paper: EAE, experimental autoimmune encephalomyelitis; MOG, myelin oligodendrocyte glycoprotein; DC, dendritic cell; MNC, mononuclear cell; PLP, proteolipid protein; p.i., postimmunization. Aggarwal, S., N. Ghilardi, M. H. Xie, F. J. De Sauvage, and A. L. Gurney. Interleukin 23 promotes a distinct CD4 T cell activation state characterized by the production of interleukin 17. J. Biol. Chem. In Press. Frucht, D. M. 2002. IL-23: a cytokine that acts on memory T cells. Sci. STKE 2002:PE1.